Fix your TSP (or other employer sponsored retirement plans like a 401k, 403b, etc.) by optimizing your fund choices and minimizing hidden fees. Manage and monitor your account, keeping you on track for retirement. Allow you to cancel at any time. Let’s dig a little deeper and see what they had to say about my TSP account. They prioritize low cost funds, which is certainly good for anyone using their services. Again, it is not an issue in the TSP but certainly is in other retirement accounts. What do I think of this? I think it is again very reasonable. They are recommending that I go 70% stocks and 30% bonds. In the bonds they are recommending intermediate term, which is a pretty standard recommendation. When it comes to the stocks, they are recommending a 34% international allocation, which is again within the 20-50% realm of reasonable international stock allocations. I go with 40%, which is what Vanguard does with their target date retirement funds. As for the division among US stocks between large and mid-cap, I’m am at about 70% large and 30% mid to small-cap. They want me at 61% large and 39% small to mid. Again, we’re in the same ballpark. Whoa, those are some pretty big numbers! I must be screwing up my TSP big time. What do I think of all this? As discussed above, they really can’t reduce my fees. Can they save me $217,396? Will it really cost me $49/day if I don’t hire them? Reading the fine print, these savings are based on this paper from Vanguard and the assumption that I’ll demonstrate poor investor behavior. You know, they might be right. While I don’t think I’ll behave badly as an investor, that is probably what everyone thinks. Most of us probably behave pretty damn badly when the market tanks. I’m not sure they’d save me that much, but who knows. They might be right. 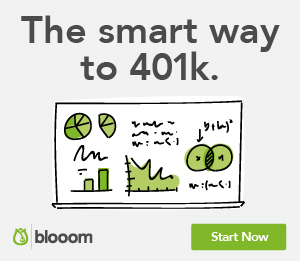 I’m not going to hire Blooom because I do my own financial planning, but I think their service is low cost and provides sound advice. Anyone who wants to use a financial advisor could probably pay way more than $10/month for advice. While I think you could get the same effect by reading this post right here, checking out Blooom is worthwhile. 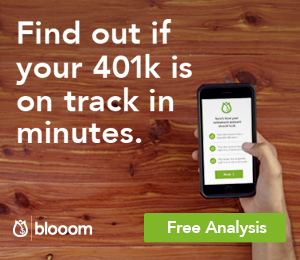 At a minimum, I’d take advantage of their free analysis to get a 2nd opinion on how you’re doing with your TSP account or other retirement accounts.